This is an Identification Bar by Dry Launch that features a (3) Incandescent Light Housing System that mounts on a Poly Plastic Bendable Backing, ideal for V Bend Cross Members. 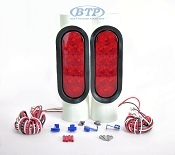 These Lights are fully submersible, making this Id Bar ideal for boat trailers. Each Light is sealed and secured in snap in housings for easily replacing bulbs. This Id Bar will mount with (2) Set Screws which are not included. This Id Bar performs the Stop and Tail Functions of your trailers lighting system. This item is use to mount to your trailers rear cross member to make your brake lighting more identifiable to other drivers. Looks as advertised. could include some advise on bending/installation cautions. Nothing included in shipment.